For the inner chef in everyone, store your knives in elegant style with an original Artelegno Multi-Sided Magnetic Knife Block made of solid beech wood and top grade neodymium magnets. Beautiful craftsmanship by masters in Italy, the Multi-Sided Magnetic Knife Block shows off your impressive knife collection on your kitchen counter that will be the envy of your family and friends. At the same time, protect your investment in high-end knives by storing them safely in a versatile magnetic knife block without worrying about dulling the edges or knives not fitting into slots in a traditional block. 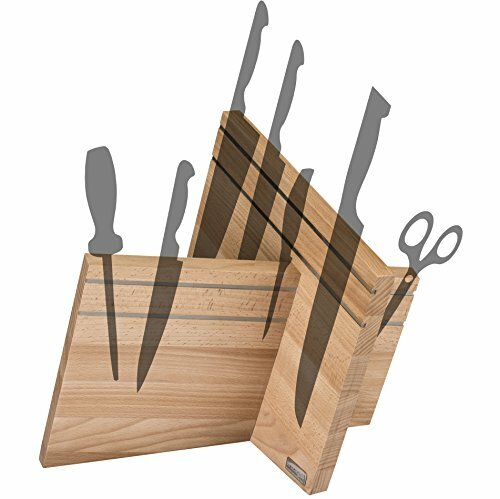 The Knife Block partitions hold most standard 16 piece knife sets with maximum blade length of 11.41 inches in a unique style unlike traditional knife blocks. Artezlegno's master craftsmen have been designing and manufacturing top-quality, solid wood creations since 1960, and use eco-friendly materials and sustainable manufacturing technologies such as renewable wood resources. Each magnetic knife block is created from solid beech wood that has been sustainably harvested from top-quality suppliers and skillfully crafted with the highest grade neodymium magnets to produce an elegant and refined storage system that works well with any kitchen décor. Only water-based varnishes that are compatible with food contact are used to finish each piece; these lacquers also have stain resistant properties to keep the natural wood looking brilliant and clean for many years to come. The Artelegno Multi-Sided Magnetic Knife Block would also make a wonderful gift for family and friends, or for the discerning bride and groom who want quality, elegant furnishings in their homes. If you have any questions about this product by Arte Legno, contact us by completing and submitting the form below. If you are looking for a specif part number, please include it with your message.